Valid EVERY SAT & SUN, All Day Long, Dine in & takeaway from 30 Sep to 22 Oct 2017. Only valid for regular slice cake, premium slice cake and square slice cake. Brownies & chocolate lava are not entitled. Limited to 3 purchased slices per customer. 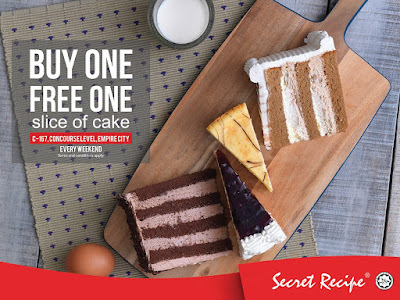 Free item is the lowest value slice cake. System will auto select the lowest value item to be free item in same receipt. Not valid with other on-going promotion, discounts, set meals and offers. Available in Empire City Damansara ONLY.